AllegroMedical.com presents The McKesson (formerly Medi-Pak) Nitrile Exam Gloves. McKesson Confiderm® Powder-Free Textured Blue Nitrile Exam Gloves are perfect for daily and especially exam use. They're a textured outer surface that improves tactile sensitivity and dexterity. Excellent conformability provides superior fit and extended wearer comfort. They're non sterile and powder free. These Nitrile Gloves are great for Ebola, MERS, Flu and other airborne virus protection. 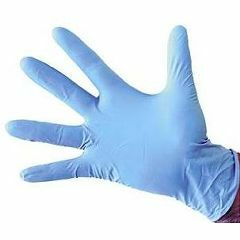 These Nitrile Gloves block alpha particles and low-energy beta particles from entering your system. Ebola hemorrhagic fever is a severe and often deadly illness that can occur in the human body. Health organizations recommend to avoid areas in which there are epidemics. For full protection its ideal to wear a gown, gloves, and mask around sick patients. These precautions will greatly decrease the risk of transmission. I use this in my Aesthetics practice and these fit the best. Comfortable. Good Fit. Easy Storage. Lightweight. Sturdy. Safe. I'm my husbands caregiver, and they are spot on. Very sturdy, comfortable, easy on and off. Good Fit. Comfortable. Easy Storage. Lightweight. Safe. Sturdy. I use these gloves for household chores and gardening. I find garden gloves and hh gloves too bulky. These stand up much better than other gloves I've used in the past. I will definitely be reordering them. I bought these to help with taking care of my 91 year old father who has dementia. He wears depends, and these gloves are great for helping clean him up. My sister loves them. do these gloves smell? there are ones with stinky smell.. I have a latex allergy and have been using these gloves for some time. I have never noticed any 'smell' from them and I have an extremely sensitive nose! Good luck! There is no smell. Others we have used smell, but these are fantastic and odorless. My husband uses these gloves after applying medicine and to protect his hands while working. Neither of us have ever noticed an odor.